Recently a customer came to our Zionsville jewelry store with a custom diamond ring design idea they had. The customer saw something similar on 42nd street (the diamond district in New York) and wanted to know if we could do any better. We pride ourselves in having an all star staff of jewelry experts and certified gemologists that can make custom jewelry that’s unique to you. After talking to the customer and understanding what they wanted we were able to craft a ring that blew the customer away with better quality, higher carat weight and it was more than $10,000 less! The custom diamond ring had 11.00 carats of very fine diamonds, exceeding our customers expectations, plus now they were supporting local Indiana businesses! This custom jewelry service was extra special as this customer had just got done with cancer treatment and he was getting this ring as a gift for his wife as she had been such an angel to him while he was going through a difficult situation. In the end everyone was happy! 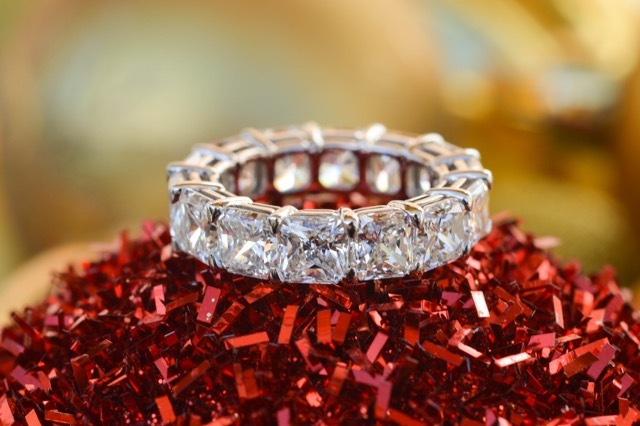 Below is this beautiful custom designed diamond ring. If you are in need of a custom jewelry piece, contact us at 317-733-0099, via our online form or stop by our jewelry store in Zionsville, Indiana for yourself and lets discuss how to make the jewelry piece of your dreams! We also provide many other jewelry services like jewelry repair and jewelry buying services to meet all your needs. Custom diamond ring designed for a customer at our jewelry store! 11.00 carat ring! On December 5th, from 10am – 8pm we will be hosting our annual Christmas Open House Event at our jewelry store in Zionsville! Kick off the holiday season at Midwest Jewelers and Estate Buyers and stop by for some Christmas Chocolate Joy from 11am-3pm as well as hors d’oeuvres and beverages from 5-8pm. Add to your x-mas wish list by checking out our all day Jill Duzan trunk show! We look forward to seeing you! View images from last years event here. RSVP to the event by visiting our Facebook page and get ready to get into the holiday spirit. Get holiday gift ideas with local Indiana jewelry designer Jill Duzan. Explore new designs and find that perfect holiday piece during our Jill Duzan Trunk Show! Jewelry pieces from Jill Duzan are known to have style inspired by nature and designed to enhance a woman’s true essence and natural beauty. So stop by our store for some holiday fun and shopping this Saturday, Dec. 5 from 10am-8pm.